Marin is the older "sister" of the two. (It is revealed that the people of the sea doesn't group into several families like the sky dwellers, but instead consider all of the members as family.) Being born out of a shell, it's unclear of whether she and Urin has any actual parents. When a ring drops into the sea, Marin is the one who finds it. 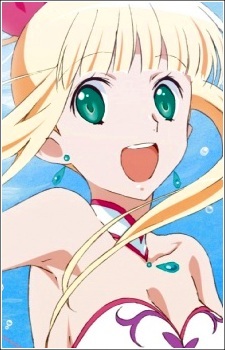 Curious about who could drop something so beautiful into the water, she heads off to land, where she meets up with Kanon, the owner of the ring. After Urin accidentally releases the skybound half of Sedna, Marin learns that she's the next priestess of the sea, and together with Kanon, she fights off the forces of Sedna.